That is the policewoman, it's just her scenes aren't all finished so there's no camera in the station. And buying the rope from the store is what causes her start moving. From what I've seen, it's the guy to the west of the convenience store that triggers Officer Naka to chase the kidnapper when she sees him, while buying the rope causes the kidnapper to wander around town instead of going back to the hideout. So you need to do both in order to get to any of Naka's scenes, and which scene you get depends on the other things you did: with the gate open she'll participate in the scene with Ai, with the gate closed she'll either have a scene standing next to the gate, or a scene while chasing the kidnapper if you stole the bag or paid the guy to not buy the game system (which definitely isn't called a Switch, honest) which also makes him steal the bag. And if you both steal the bag and lock Ayumi out of the house it triggers the double scene with Naka and Ayumi. Sharing Newp's findings on Girigiri Dungeon. Fun but unhookable, which is a mess because this game is a bit more complex than a typical RPG. Card numbers move you forward on the field, and do damage in battle. Higher numbers do more damage. When you enter (and exit) battle, the main number on the card swaps with the smaller number in the corner. When you fight a monster, the colored dot shows which element it's weak against. 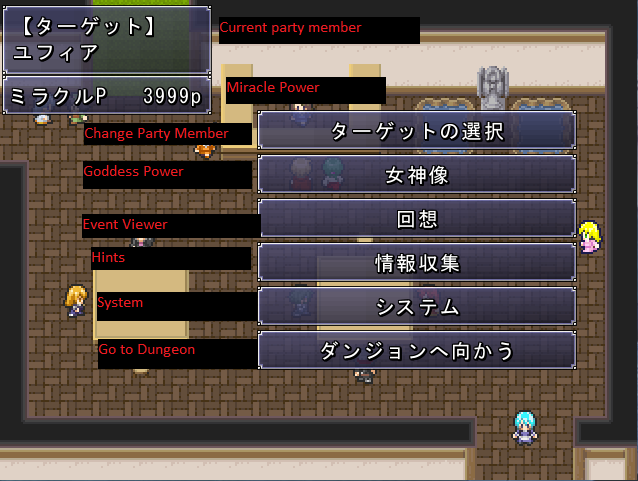 When using Goddess Powers, you can use the abilities without buying them (second option). If you do, you take double the diuretic penalty. 1) shows your targets bladder guage. 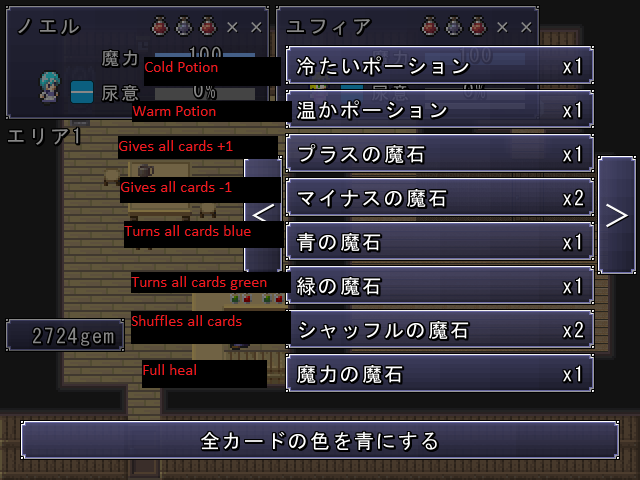 On top of map events, there are warm and cold potions you can use to manipulate the target, too. Force feed potions to the target and not Noelle. Make target cold and Noelle warm. There are 4 areas, so general strat is the use area 1 and 2 for item gathering. Area 3 to make the girl desperate and Area 4 to make her wet herself. Do enough runs and you'll level up which increases Noelle's capacity. Sometimes potion slots on a character are disabled: this is related to their desperation, and whether they're hot or cold. Potion level affects their stat boosts, health recovery and also diuretic level. 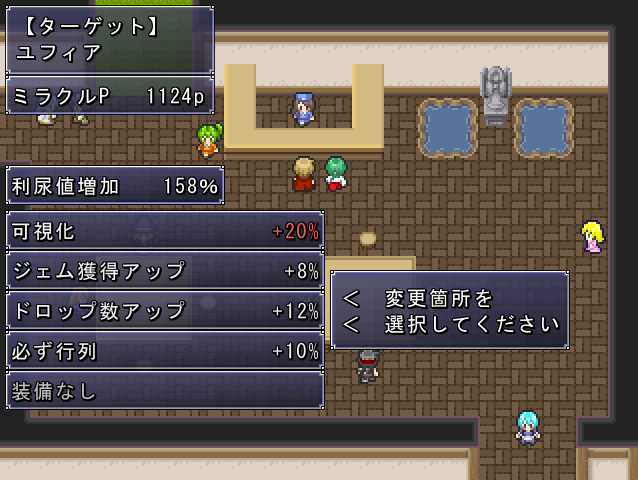 力 potions are attack boost, 守り potions are defense boost. The game is considered clear just once you make both girls wet themselves; you unlock 5 bladder transfer items every dungeon run after that; it can be used to either empty Noelle's bladder, empty your targets bladder, or transfer from Noelle to your target. Somehow you can unlock the ability to pay 300 points to view scenes without having to get them the normal way. May or may not need game completion first. Did anyone seen theese already? I bought one of the games, and frankly it felt lackluster and overpriced. There were no CGs at all and they were pretty short too. This is something from CASTLAGE artist as far as I understand. Some "cases" and one game at the top. The payment process here is more tricky for the content is avaliable only from japanese version of site and there is no option of buying points directly. Only via some electronic money payment systems wich are not familiar to me for now. Maybe you could try one of these also?